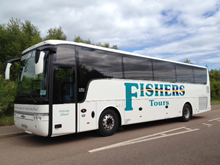 Welcome to Fishers Tours of Dundee! Over the last couple of decades we’ve been busy building up our reputation as one of the premier providers of bus and coach travel in Dundee, Angus and Fife. We specialize in coach hire, school transport and local/long-distance services, including our extremely popular Scottish Express Service. We can also organize a day trip or coach holiday to suit specific needs throughout the UK or further afield. We are noted for our clean, comfortable and well presented coaches. Our uniformed driving staff are renowned for their courteous and friendly service, and of course, all of our coaches are fitted with seat belts. Our Scottish Express Services are now in their 12th year and travel to destinations throughout Scotland. Setting off from Brechin, Kirriemuir, Forfar, Arbroath, Dundee, Fife and points in-between, you travel to the destination of your choice with no changing coaches. We pick up and drop off at points all along all our routes. To find out if we stop at a stop near you, or if you wish to reserve a seat, or just to find out more information on the 2019 timetable, call us on 01382 227290, then select option 1. It costs nothing to book your journey and we accept the Scottish Executive Concession card, so bus pass holders can travel free on any of our Scottish Express services. We also offer adult and child single or day return tickets to all our destinations, which can be purchased from the driver. Remember, there’s no booking fee and it costs nothing to travel, either, if you have a Scottish Executive Concessionary Pass. Please remember that when you book a seat, unfortunately we are unable to reserve specific seats on the coach. Reserving a seat merely means that, especially on busier runs, you are guaranteed to be able to travel.